Looking forward to a long-distance flight in your future? Since 1980 my husband and I have travelled long distances between New Zealand or Taiwan and America. Just two weeks ago we flew from Minneapolis, USA to Invercargill, New Zealand. From the first airport to the last, this took us 34 hours. Seems like as soon as you figure out the details of air travel, they change the rules. 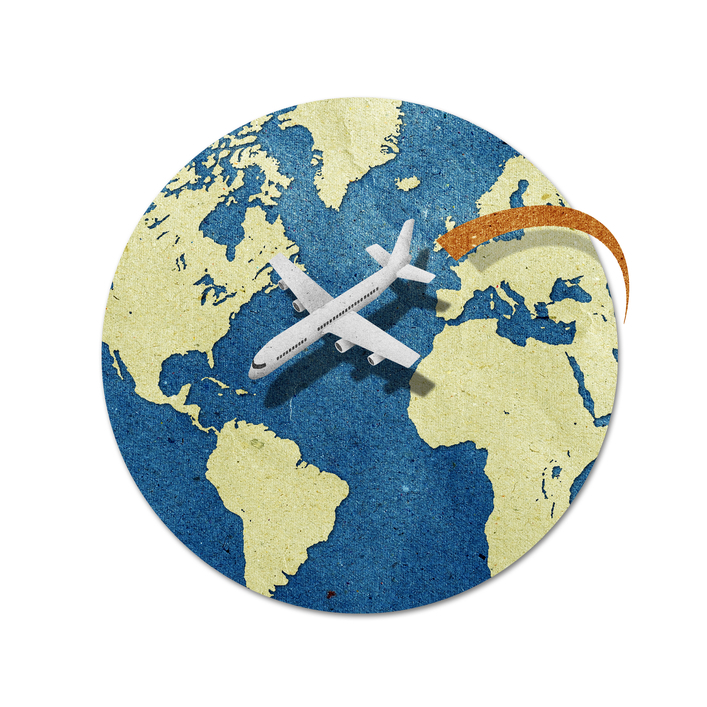 But here are some long distance travel tips that have helped us. 1. Find out your luggage and carry-on requirements well ahead of your travel date. Don’t assume you know what you can bring. These requirements are constantly changing. 2. Don’t spend a lot of money on classy looking luggage. Just one long distance flight can put a lot of wear and tear on your luggage and the baggage requirements could make them unusable in a few years anyway. Second hand luggage often works well. We look at it this way. Our burnt orange suitcase may not look classy, but it’s easy to find on a carousel of black bags. 4. Choose lightweight luggage. Today little consideration is given to the size of your baggage. Weight is supreme. Some carry-ons with wheels weigh the maximum weight allowance before they have anything in them! If you choose a suitcase that is too big, you may have a hard time filling it without exceeding weight requirements. 5. Use clear zip-lock bags inside your luggage instead of specialty ones. They weigh very little and you can see what’s inside without opening them. Put liquid items in bags so if they do leak, they won’t get all over your suitcase. Tiny bags are ideal for jewelry. Put a cotton ball with jewelry that might get damaged if squished. Then put all the little bags in a bigger one. 6. Don’t forget to alert your travel agent to any food allergies. 7. Weigh your filled baggage before you go to the airport. Digital scales that fasten onto the handle of a suitcase work well, but be prepared for them being several pounds off. If you are carrying bags which are loaded to full capacity, be prepared to shift a few things around at the counter to avoid overweight fees. 8. Make sure you have any pairs of scissors or pocket knives packed in your checked luggage so you don’t lose them going through security. 9. Limit your carry-on liquids or gels to 3-1-1. Each container can’t be larger than about 3 ounce (3.4 ounces or 100ml). Put all containers in a 1-quart bag. Each passenger is allowed 1 bag. The easiest thing is to put all of these items in your checked luggage. For a long flight you might want a small bottle of lotion and a tube of lip balm since air travel dries skin, but you’ll lose your bottle of water or container of yogurt if you try to bring them through security. Some extra allowances are made for medications and baby formula. 10. If you will be changing currencies during your travels, remember to bring a small amount of your home currency for your return trip. That will keep you from having to put a very small purchase, like a snack, on your credit card. 11. Save money on drink and food by packing your carry-on wisely. You can’t bring a bottle of water past security, but you can bring an empty water bottle or cup. Once you are past security you can fill it with water. Keeping hydrated is important while traveling, but drinks in airports are never cheap. Food is also expensive and your choices are greatly narrowed by the locations of food outlets. The airport may have good choices, but none of these may be close to the gates you need to use. Trail mix comes in handy for layovers and takes quite a bit of abuse in luggage. Apples travel well, but if you bring them make sure you eat them or dispose of them before changing countries or areas with restrictions. Bringing a forgotten apple into New Zealand will cost you around NZ$100. 12. Don’t sweat the small stuff when packing. Many forgotten items can be purchased at your destination. However, make sure you have these items in your carry-on before you pull out of your driveway. •	Anything that would be very hard to replace, such as contact lenses. •	Contact details of the person you are to meet and where you will be staying. If you are traveling to another country you’ll need the details of where you’ll be staying for the immigration form. You would also need to be able to contact the person who’s meeting you if you encountered changes in your flight. Once we forgot these details on a trip to Singapore. When we landed we couldn’t find the friend who was meeting us at our gate and we didn’t know his address or phone number. He had a very common surname and no one was at the church outside of office hours. We almost had to take a taxi and just find a hotel somewhere when we finally found him. 13. Pack your carry-on for comfort and convenience. If your carry-on weight limit is 15 pounds (7 kilos), you’ll be surprised how little it takes to reach your weight limit. During our last trip to and from the US we were changing seasons drastically flying both directions. I also knew from experience that I sleep much better during the long flight (more than 10 hours) if I have an extra pillow. My husband and I each rolled a sweater into a roll and inserted them into a cloth bag with a drawstring (like a shoe bag.) The bags held the sweaters together in a good pillow shape, and when we reached the cooler destination, we could wear the sweaters. You might want to pack eye shades, ear plugs, and a sleeping tablet for an overnight flight. 14. Take an e-reader. It takes less room than a book and gives you a wider reading choice. We found that the American airlines now allow passengers to use them during take-off and landing, though Air New Zealand doesn’t allow this yet. 15. Keep valuables attached to your body. A belt pack can be strapped at your waistline to hold your passport, cash, and credit cards. If you carry a computer, keep a good eye on it. Count your carry-ons each time you go through security to make sure you come away with them all. 16. Relax in the airport. If you have the essential items mentioned in #9, you can replace anything you’ve forgotten. Patience and cooperation will get you through security. If you miss your flight because it takes too long in security, the airlines will get you on another flight. Let the airlines handle weather problems and irritations. Determine not to let small irritations spoil your flight. 17. If you arrive at your departure gate early, check the department monitor again closer to departure to make sure your gate hasn’t changed. This is especially true if the time of departure draws near and the waiting area isn’t filling in the ordinary fashion. We had our departure gate changed twice for one of our flights after we had found our original gate. 18. If you have a small bladder, try to get an aisle seat, especially on very long flights. 19. Take advantage of lay-overs to walk and move around. This will help alleviate sore muscles during the longer flights. 20. Enjoy your stay at your final destination!